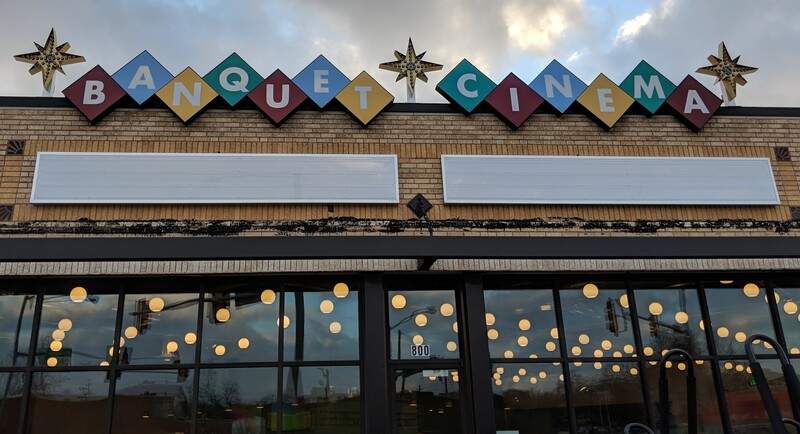 The man behind Bleu Garten has struck again with the soon-to-open The Banquet Cinema Pub, a two-screen movie theater with an honest-to-god kitchen and bar near Film Row. 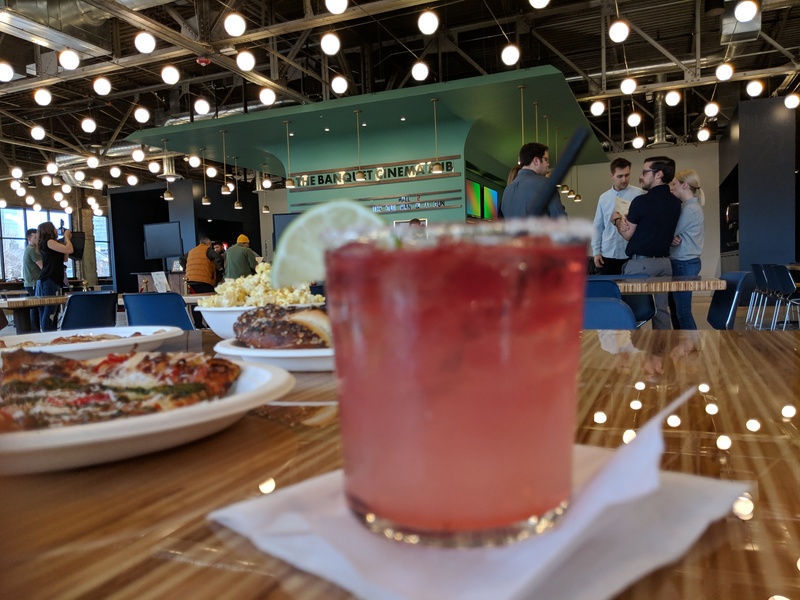 Wheat foresaw the food truck boom hitting OKC and wisely created a venue that showcased the metro’s burgeoning mobile food scene while providing great drinks in a relaxing setting. That same vision is clear in The Banquet Cinema Pub, where he’s bringing first-run movies in a small-theater scene with a head chef poached from Mary Eddy’s Kitchen x Lounge at 21c. Each theater holds less than 100 people and each row comes with a long bartop so you can eat and drink during the show. One theater will show first-run movies. The other will feature cult classics, live sports, election returns, etc. “Whatever people want to watch together and be social, we’re open to doing it,” Wheat said. And that’s what makes me so excited for Banquet Cinema and the next wave of restaurantertainment spots coming to the metro. Here’s the thing: 15 years ago, Oklahomans were just excited that restaurants were opening. Chains, franchises, locally owned; we didn’t care. It was just so flattering that anybody was giving us any thought. But look at us now. Look at how many “First Looks” I’ve written in the last couple of months. New restaurant openings are barely an event. What we’re still missing, even as our dining options have multiplied exponentially, is something to do when we’re not eating. Executive chef Jeff Patton has some big ideas for Banquet Cinema and I’m really looking forward to seeing how they come to fruition. The initial menu takes a few swings, but it’s largely a crowd-pleasing collection of tasty upscale bar foods. Obviously you’re getting popcorn. 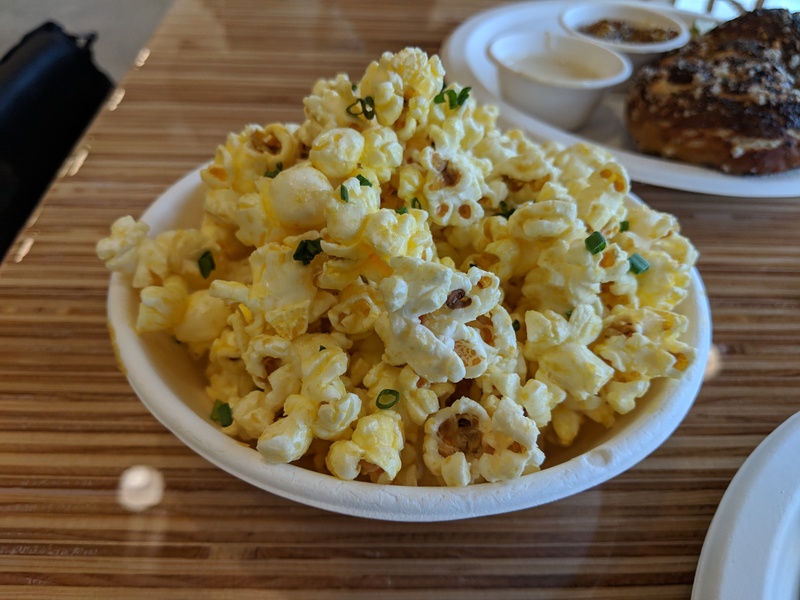 At $2, it’s a lot cheaper than what you’re getting at larger chain theaters, but it also has the option for $1 more to add “crack butter” and chives. Crack butter is clarified butter (melted, with all the milk solids skimmed off) mixed with nutritional yeast, which has this funky, cheesy pop to it that is deeply satisfying. 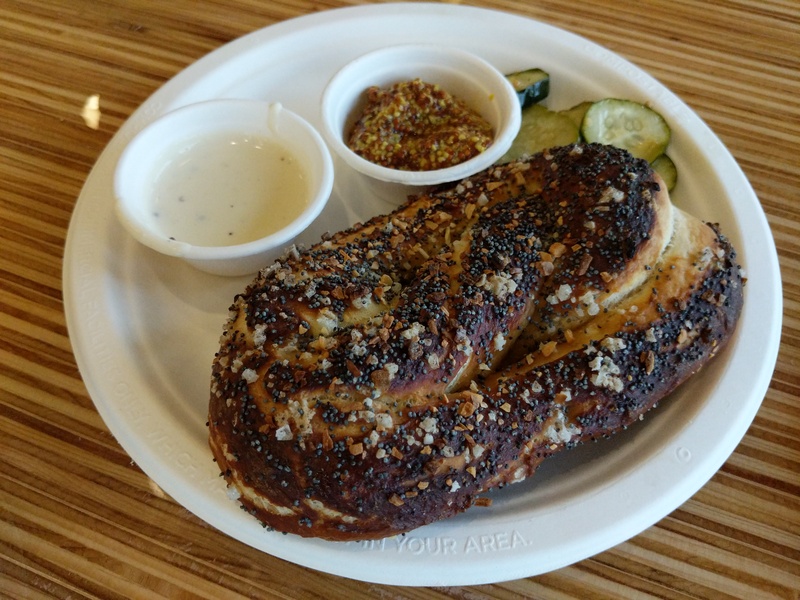 The onion and poppy seed pretzel ($7) is this gorgeous hunk of soft, pliant bread absolutely caked with savory seeds and served with beer cheese and stone-ground mustard. I shared some with my pay Dennis from Uncovering Oklahoma, but next time I’m taking this carb-y delight for a solo test drive. I wasn’t super into the baked chicken wings, but as Patton was soliciting criticism and really looking for ways to improve, I’m sure a newer iteration is coming that I’ll be all about. 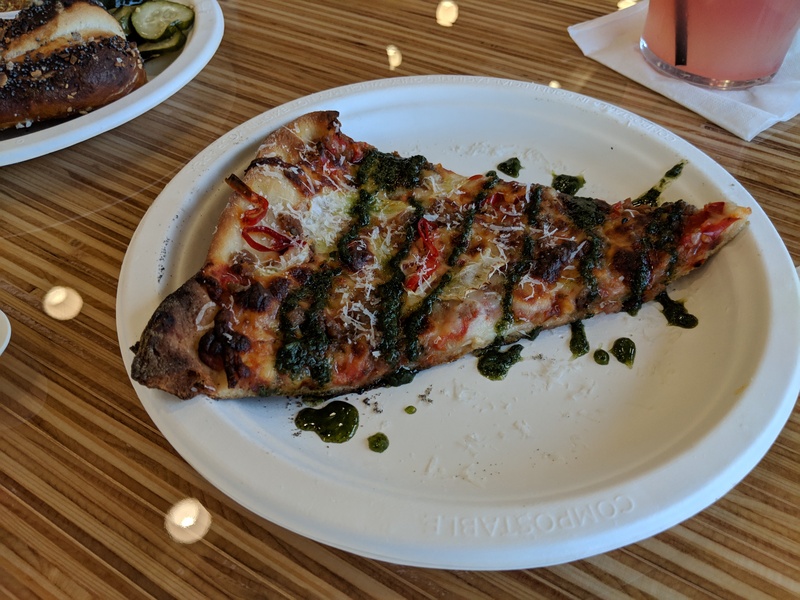 Pizza seems to be the main course at Banquet Cinema, at least initially, with slices ranging from $3 to $5 and whole pies from $24 to $40. Both the Casablanca (pepperoni, mozzarella, pecorino) and Moonstruck (sausage, fennel, basil oil and Calabrian chili) were top-tier classic pies that I could destroy on command. I was of two minds on the True Grit, which is a white pie with taleggio cheese, Speck ham and a beer jelly made with Stonecloud’s Neon Sunshine. As a dipper, the jelly is great. Drizzled over the top, however, I felt like it was a bit too much. It’s such a powerful flavor, you don’t want it to overpower and bury the flavor of the ham and cheese. For dessert, the warm chocolate chip cookie ($2.50) is so stupid good I’m kind of mad about it. Patton said the key is they try to serve the cookie as close to raw as possible, so it’s warm and gooey and just melts on your tongue. It’s...wow. So buttery. After a couple of months of business, Patton is planning to roll out specials that pair with the movies on the screens. And also, probably, hopefully, some of his hand-crafted charcuterie. Coming from Mary Eddy’s, where the Toolbox charcuterie is some of the best around, I’m sure it will be worth the wait. Look for Banquet Cinema to open mid-February. My guess is you’ll be able to tell by the line out front.